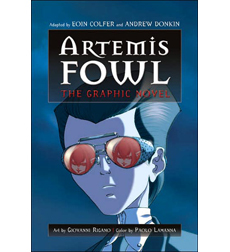 From a strikingly original new voice comes the story of Artemis Fowl, a very unusual hero. Artemis is a genius, a criminal mastermind, and a millionaire…and he is only twelve years old! A combination of Sherlock Holmes, James Bond, and Attila the Hun, even Artemis doesn’t know what he’s taken on when he kidnaps a fairy — because these fairies are armed and dangerous, and don’t play by any rules!